Fine dining and exquisite sushi establishment, HASHIDA, opens its first restaurant outside of Japan at Orchard Road, Singapore. In Kachidoki, Tokyo, a stone’s throw away from the world famous Tsukiji fish market, lies one of Tokyo’s hidden gems known among only those with a refined and discerning palette: Hashida Sushi, which is currently headed by Master Sushi Chef, Tokio Hashida. With two decades of culinary experience under his belt, Tokio Hashida’s son, Kenjiro Hashida, better known as Hatch, (pronounced as Haa-chi) will be presiding over Hashida’s first overseas fine dining restaurant in Singapore. Himself a celebrity chef in Tokyo, Chef Hatch is a graduate of the renowned L’Ecole Tsuji Tokyo, Japan’s top culinary school, and has apprenticed under his father since he was 14. Through the disciplined upbringing and mentoring from his father, he has carefully honed his culinary skills to carry on the family’s proud history and philosophy. The restaurant was financed by Singapore’s local lending institutions. Chef Hatch has built on his rich family tradition to develop an entirely new sushi dining experience for HASHIDA Sushi Singapore, with an emphasis on exquisite seasonal produce in his repertoire. The best of Japan’s four seasons can now be savoured, right here in Singapore. This inventive haute dining establishment at the Mandarin Gallery features premium grade and authentic Japanese sushi, served omakase style in a luxurious, intimate and authentic Japanese setting. By integrating top-of-the-line food and service offerings with a philosophy to impress, Hashida Sushi Singapore promises to create an unforgettable lifestyle dining experience served to privileged dining connoisseurs. 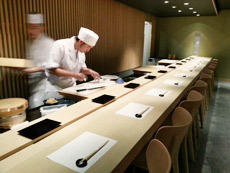 In addition to the traditional setting and authentic Japanese aroma which the restaurant evokes, it is the art of sushi practiced by Master Chef Hatch that leaves diners with a culinary experience which is not only culturally intoxicating, but also one which sparks all of their senses with excitement – an experience which only the Hashida Family can provide. For over a century, the Hashida family has continually concocted ways to please the palate through time tested creation. This is evident from the collection of over 30 sauce blends being used in Hashida Sushi’s family recipes today, giving off delicate and unique aromas, flavors and aftertastes designed to complement each and every dish served. Among these lies the family’s trump card – a secret sauce developed more than 135 years ago. This transcendent technique and formula has been treasured and passed down from generation to generation, and more recently, on to Chef Kenjiro ‘Hatch’ Hashida to share with Singapore. For over 2000 years, rice has been the main source of agricultural produce and a dietary staple in Japan. It is no wonder the Japanese consider it an esteemed cultural heritage. Hashida Sushi Singapore imports a specially selected strain of white-hulled rice grains from Japan, so as to produce sushi creations of optimum quality. Rice tasting is carefully carried out by the family to determine the best blend of grains used that will marry perfectly with the fishes and sauces. Slightly translucent, soft and not overly sticky, the steamed grains are mixed with select Japanese rice vinegar and premium sugar of a carefully measured amount – to produce sushi rice of unrivaled charm, only to be found at Hashida Sushi Singapore. To further embellish the intimate and opulent dining experience, exclusive and artfully-selected tableware is given emphasis in a traditionally tranquil and elegant setting of Hashida Sushi Singapore. For full immersion into the heart of Japanese culture, ornate and antique dining wares, some spanning more than a hundred years have been carefully curated from the family to enhance the aesthetic enjoyment and appreciation for each dish. Even making a toast is a remarkable experience, with the usage of specially-crafted sake cups handmade by Japanese Masters using the finest glass and pewter. The revered tradition of multi-course haute Japanese cuisine served omakase style has long been the unwavering custom of the Hashida family, who pride themselves in moulding the best of nature’s offerings into an art form and gastronomic adventure. To experience Japanese dining the Hashida way would be to savour the perfect balance of flavours, textures, colors and fragrances, while being served delightful creations to progressively whet the appetite. Delicate techniques and craftsmanship are significantly apparent in the dishes, and accompanied by teas used by the family for many generations to complete the magic of dining at Hashida Sushi Singapore. A ‘boutique’ fine dining locale at 1,300 square feet, Hashida Sushi Singapore is for individuals with a discerning palate. With a limited seating capacity of no more than 26, each guest is ensured an immersive omakase experience alongside focused customer service, to fully enjoy a menu that epitomises the Art of Sushi. Interaction and conversation is customary for an ultimate experience. In addition to presenting the omakase menu before their guests, Chefs at Hashida Sushi Singapore are enthusiastic to share their experiences and views about sushi etiquette, culture and appreciation as well as the origins of ingredients and traditional sushi-making techniques. 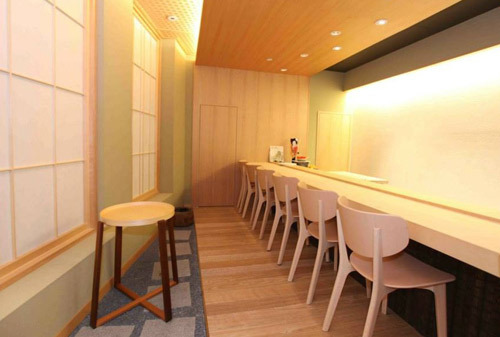 Conceptualized by Chef Hatch, this uniquely cosy Sushi-bar at one end of the counter incorporates smartly a “dining-setting” to allow either a party of 6-8 diners “or 2 parties of 3 or 4” to enjoy pleasurable conversation with each other with ease and comfort. Omakase diners who enjoy observing their food being prepared over a smattering of dialogue exchanges with their chefs, would certainly expect to be seated side-by-side at the sushi bar. Yet, larger groups of three or more in this arrangement may make conversation amongst each other a little more difficult to achieve. For the ideal dining experience about good food, heartwarming service, pleasant company and most of all, comfort in communication; Chef Hatch has ingenuously designed a solution for groups of diners to achieve this with the Group Counter: a ‘bonding’ section at the end of the bar which allows for a party of 6-8 diners “or 2 parties of 3 -4” to enjoy the pleasure of each other’s company, without compromising on the unique Hashida omakase experience. 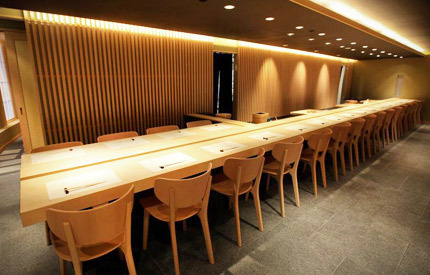 Being seated together at the Group counter enables a full view of the sushi preparation arena and at the same time, pleasurable conversation with one another – a perfect marriage of both worlds. An innovative, yet long-standing cuisine awaits the discerning sushi lover with a deep and emotional relationship with culture, and who appreciates food as an art form. With nearly 20 years of experience in preparing Japanese cuisine, celebrity Chef Kenjiro ‘Hatch’ Hashida will be presiding over his family restaurant’s first overseas fine dining restaurant in Singapore. The Hashida Sushi is a premier sushi restaurant originating from Tokyo, its inaugural outlet being currently headed by Chef Hatch’s father, Master Sushi Chef Tokio Hashida. This inventive haute dining establishment at the Mandarin Gallery features premium and authentic Japanese sushi, served omakase style in a luxurious and intimate setting. By integrating top-of-the-line food and service offerings with a philosophy to impress, Hashida Sushi Singapore promises to create an unforgettable lifestyle dining experience served to privileged dining connoisseurs. A Japanese term for “I’ll leave it to you” or “I trust you”, omakase (pronounced as ‘oh-ma-kah-seh’) in culinary terms loosely translates to ‘Chef’s choice’ – where diners are served a fully-customizable menu featuring premium imported ingredients from Japan, comprising the best picks of the season. According to one’s delight, the chef will serve his finest and freshest sushi of the day depending on market produce availability and the individual’s palate preferences. Hashida Sushi Singapore’s omakase delicacies embody the signature creative spirit of Chef Hatch, while remaining deeply rooted in Japanese culture. At the same time, it endeavours to delight each diner with an element of adventure and surprise. Rice is the building block of fine Sushi. This is a signature of Hashida Sushi Singapore. Every year, Hatch and his father will check out the rice harvest before making their selection. Using a family secret recipe, the rice is cooked to perfection with a right balance of moisture, texture, aroma and flavours. Every pearly rice is fully formed with just the right amount of bite to assert itself in the mouth. 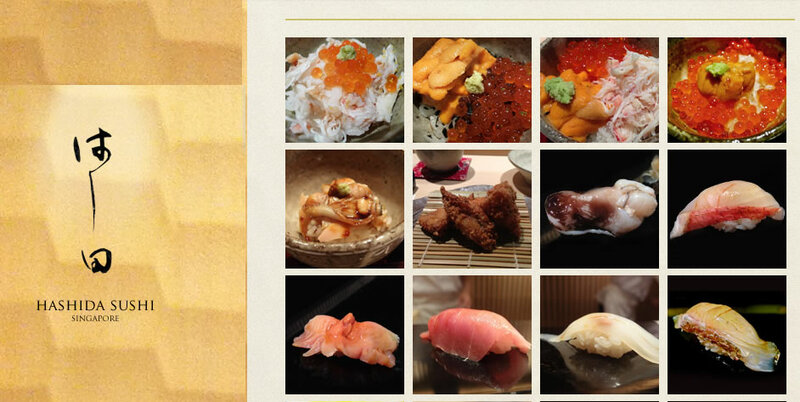 The quality is paired perfectly with sushi or a rice bowl of Salmon roe, Sea urchin or Hokkaido Crab. Hashida Sushi Singapore serves distinctive seasonal produce at the height of freshness, combined with only the best ingredients imported from Japan 4 times weekly. Reliving a fine sushi meal in Tokyo, patrons may look forward to a curation of exquisite, often exotic and rare seasonal products presented at their aesthetic and culinary best. The best of Japan’s four seasons can now be savoured here. Chefs will also advise and offer a selection of choice wines, superior “rare to find” Japanese sakes (some exclusive to Hashida Sushi Singapore) and other quality beverages to complement its omakase dishes. With the launch of Hashida Sushi Singapore comes an enthralling omakase experience on a whole new level: to celebrate the true essence of Japan through traditional haute cuisine and high aesthetics, in absolute seclusion. Tucked away in a discreet corner of the ‘boutique’ fine dining locale, the coveted Deluxe Private Dining Room seats up to 6 and boasts its very own sushi bar – a spot where top personal chefs will showcase Hashida Sushi’s most premium offerings to the best effect. This elegant and cozy counter space provides a classically majestic setting, and promises unforgettable gastronomic moments coupled with warm, attentive and professional service like no other. So passionate and deeply-rooted in Japanese philosophy and culture is resident Master Sushi Chef Kenjiro ‘Hatch’ Hashida, that he has devoted his creative energy to designing and curating the room with his finest personal selection of antique furnishing and tableware. Diners can expect to feast on fresh, intricately crafted sushi served omakase style, while soaking in the uniquely charming atmosphere of wooden panelling and spectacular traditional Japanese décor. Emanating a delicate and distinguished ambience inspired by the serenity of ancient Japan, the Deluxe Private Dining Room echoes Chef Hatch’s eye for detail and outstanding quality, and serves as a tribute to memorable fine dining moments marked by Japan’s long-standing legacy, extraordinary cuisine, and inspiring conversation.